Although I am just in the process of learning how to integrate technology into my future classroom and using it as a means to encourage creativity and innovation, there are many teachers who are leading the way with the technological revolution. One such teacher is Shelly Fryer, a teacher, author, and speaker who teaches 3rd and 4th grade at Positive Tomorrows - Oklahoma's only school specifically for homeless children. She has taught in a 1:1 iPad classroom since 2013 and has been named a PBS Digital Innovator in 2015. Shelly also presents nationally at education and educational technology conferences. One of my favorite blog posts of hers is the Technology Skills 101 for Teachers. This post was written after an Oklahoma A Plus retreat to brainstorm for the question “What does it take to successfully integrate into a classroom?” In this day and age where technology is becoming such a vital part of society and more and more classrooms are becoming 1:1 with an iPad or computer for each student, it is important that teachers know how to integrate technology and not just use it as a supplement. Her first point is, in my mind, the most important. To be able to successfully use apps, an iPad, or a computer, a teacher has to know how to use it their self. After all, if they don't know how to use it, how can they teach it? And if they aren't familiar with the apps, how can they know what is appropriate to use, which ones can be combined, or in short the potential? Reaching this level isn't hard - sometimes it comes down to exploring an app before it gets used in the classroom, or by learning vocab terms associated with iPads. This funny example, posted by Shelly Fryer's husband, Wesley Fryer, just goes to show how the little things can slip past you! Shelly also makes a good point when she mentions the importance of creating "channels" to save and share work form the students. This may mean creating a class website so parents can view what their child has created, a class radio station, or even simply using certain websites for research and sharing to keep students on track without getting distracted - one of the biggest concerns with using the Internet! Shelly says that she uses the QR creator http://createqrcode.appspot.com/ to create QR codes that students then scan with the app i-Nigma which leads them straight to the video or webpage she selects so they don't waste time searching or get distracted. Depending on the age level of the students, it might also be advisable to use a kid-friendly search engine when looking for pictures, such as Photos for Class. Finally, one of the most important parts (and the reason why we use it) of technology is the power it gives to students. It allows them to be creative, innovative, and do something different than the standard presentation or paper. They can show off what they know - something that also helps teachers with new assessment techniques and may allow a student who normally doesn't excel with traditional projects to shine. The more I read about technology, the more excited I become about the opportunities it gives to both teachers and students. Although it is something newer and perhaps different than teachers know, it opens up practially the entire world to students! 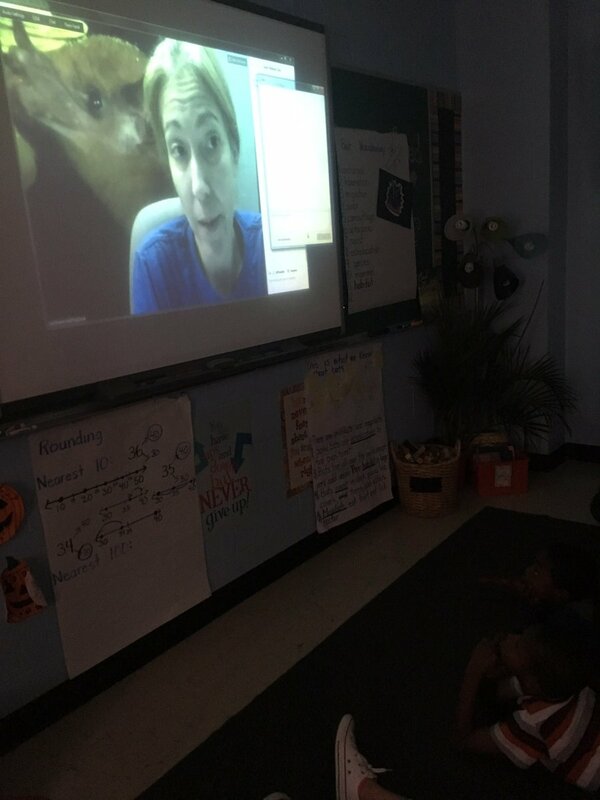 Where else could you hold a live webinar with the Organization for Bat Conservation during a unit about Bats?